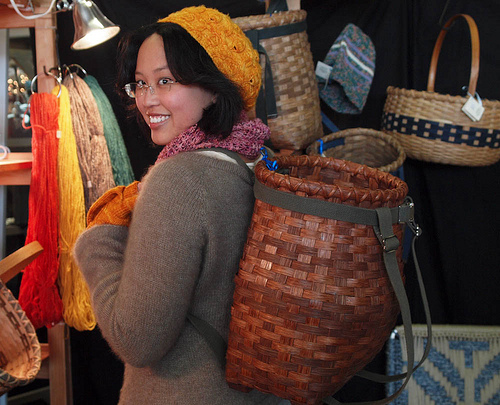 Rhinebeck was so much fun this year – really, it can’t ever *not* be fun. It just gets better and better every year! We got to the fairgrounds around 9:30 on Saturday and managed to shop a wee bit before heading to the Rav meetup. I found a basket backpack and some Cormo in Building A. 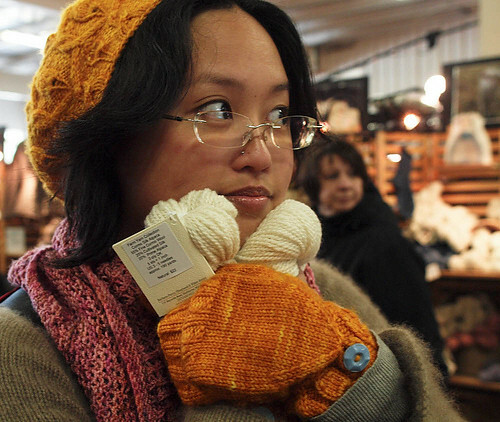 As you can see, I was somewhat unprepared for the cold weather even though I knew about it, so I borrowed Ysolda’s Snapdragon Tam and the Snapdragon mitts as well. I think the colour actually kinda works on me – I’m always hesitant about yellows, but this one’s nice and golden. The Saturday meetup was awesome – I loved seeing everyone’s reactions to Bobsolda! 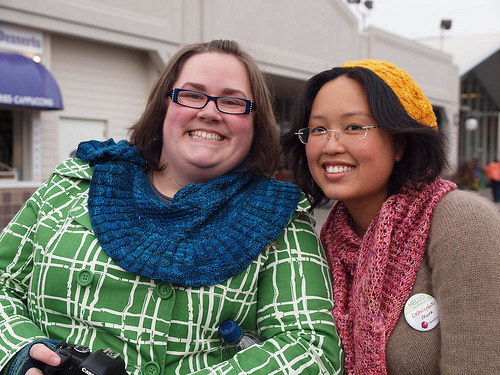 And I got to see Bonnie with her gorgeous teal Sagano shawl, which she test knit for me. After the meetup we headed out to the Elks Lodge to set up for the party. I manned the button table, which was great since I got to say hi to everyone coming in! The party was a blast as usual, cupcakes were had and nibbles eaten. Sunday was way more low-key – after the meetup I went off to find my Got Soap and headed to my book signing in Building B – lots of great books and authors there! Afterwards we all met up again, did some shopping, and headed back to the (amazing) house for dinner. Can you believe we could all eat dinner at the same table at once? 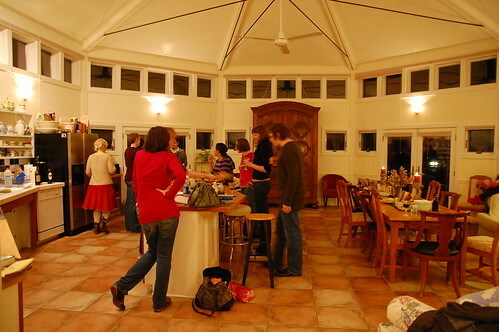 That was a huge kitchen. I had such a nice time, I can hardly wait for next year. Next up, the yarn! Sounds like lots of fun! Some day I hope to be able to go. You all look so “put together” What fun!! 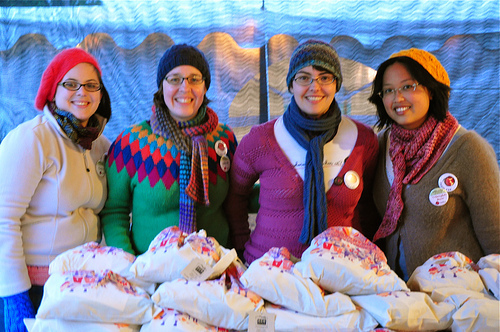 It was so nice to see you again at Rhinebeck & the Ravelry party! Love that kitchen – who does it belong to? Looks like so much fun! :-) So did you buy the basket backpack, or just model it? Oh do tell where that lovely Cormo you’re holding came from! Thank you for sharing the photos! I love the backpack basket!! I love the backpack basket. It is such a different look (though I’d be afraid to take it on the train – it would be completely crushed by rush hour). 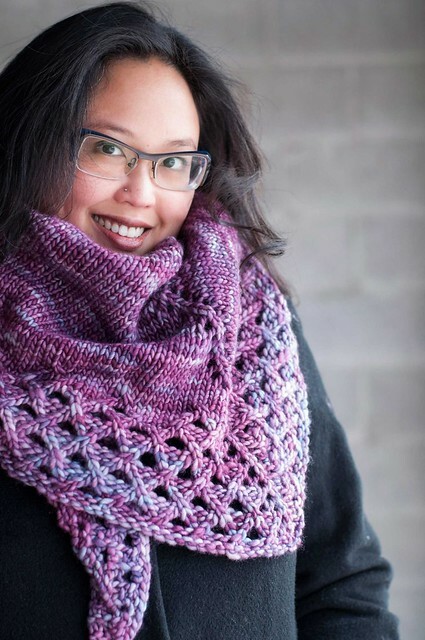 Gorgeous shawl, just fabulous, texture and use of sock yarn. Wowza! That basket backpack is pretty much the coolest thing ever! It was so nice to meet you in person. That Snapdragon looked fabulous on you, I have to say…definitely a good color for you!